treating our patients (our dental family) as they would want to be cared for – with kindness, empathy and respect. earning and maintaining our patients’ confidence. providing a calm, comfortable and enjoyable experience for our dental patients. working in concert with our patients, each staff member taking full responsibility for his or her role in providing optimal dental care. working together as a team in a spirit of mutual respect, support and accountability. making a positive difference in our patient’s lives. Convenience: Oakview Dental is pleased to offer early morning dental appointments for the convenience of busy urban Vancouver professionals. We’re centrally located, easily accessible by bus, and there’s plenty of underground and street parking. Patients also enjoy the convenience of ‘one-stop dental shopping’. If specialist referrals are necessary, all other dental disciplines are conveniently located in the same building. We accept all major credit cards, debit cards and cheques (including post-dated). Comfort and wellbeing: The comfort and wellbeing of our Vancouver dentistry patients is our top priority. Gentle aromatherapy scents calm the senses as patients are treated to soothing lip balms, cozy blankets and special back and knee rest pillows, all while gazing at the fabulous, panoramic view of False Creek, English Bay and the North Shore mountains from our customized plasma-padded dental chairs. Don our wireless headphones to watch television or a current movie from our great DVD collection, or just listen to our satellite radio. At the end of each appointment, patients are treated to a warm, moist towel. 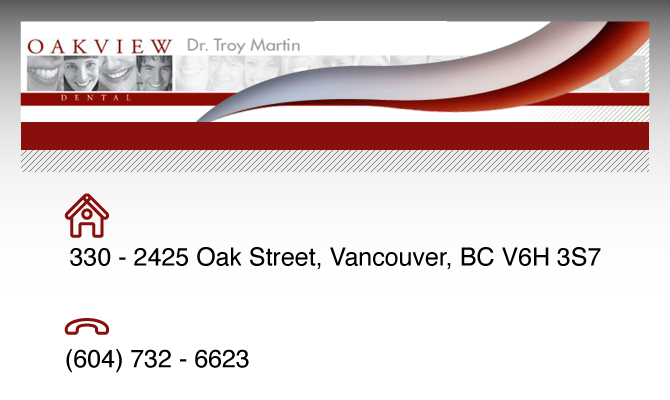 Since graduating from University of Saskatchewan College of Dentistry in 1996, Dr. Martin has worked in Vancouver with practitioners that are industry leaders in digital dentistry. In 2010, he arrived at Oakview Dental, a long standing and highly reputable dental practice on the Broadway corridor in the prestigious Oak Dental Centre building. Dr. Martin is currently a member of local advanced continuing education study clubs in the areas of implant dentistry and all ceramic dental restorative materials. Dr. Martin is a certified provider of: CEREC restorations (CAD-CAM, one appointment all ceramic inlay, onlays & crowns); Invisalign (the modern-day, clear alternative to braces) and Botox Cosmetics. Dr. Martin’s primary focus is to provide modern, state-of-the-art dental care while educating each of person individually about proper care of teeth and gums to help achieve and maintain optimum oral health.